Sunday’s NFL slate was billed as one of the least exciting of the season, and it lived up to the hype. While Tim Tebow might have led another fourth-quarter comeback in Miami and the Jets and Chargers entertained us for a bit early on, it was a good thing the World Series was on that night. 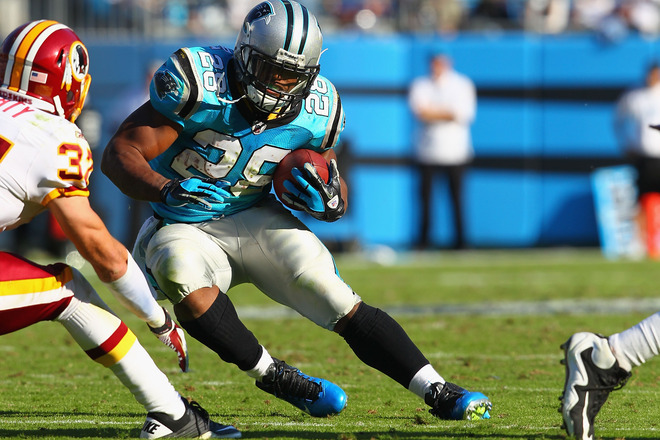 The Panthers went with their alternate light blue jerseys in a victory against the Redskins. This look works and certainly brings out the light blue outline on the silver helmets. It also matches another football team that plays in North Carolina. Minnesota chose a throwback look for the second time this season in a close loss to the Packers, which is always nice to see. The Saints dominated the Colts in white at home. I had a sneaking suspicion New Orleans might go this route before the game, but was hoping it wouldn’t be right. There was certainly no getting in the Saints way as their offense soared and Drew Brees ruined my perfect record in fantasy football. 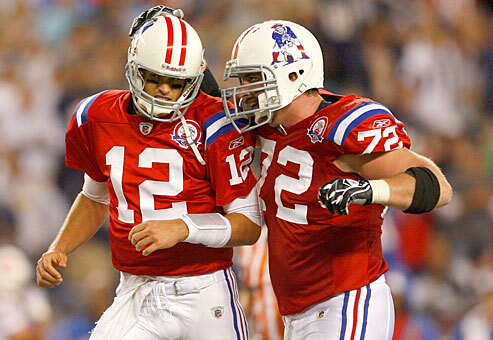 It seems like Tom Brady and the rest of the Patriots will wear these throwbacks against the Jets this weekend. A friend with knowledge of the situation tells me the New England Patriots will wear their throwback uniforms for this Sunday’s divisional showdown with the Jets. These uniforms were worn by New England from 1961-1992. Last year, the Patriots wore these against the Vikings and wore them frequently in 2009 when it was the 50-year anniversary of the AFL. My friend told me the throwback helmets and pants were hanging the Patriots locker room Monday after practice. Usually teams do this to break in the equipment during practice leading up to the game. These are solid uniforms and I am looking forward to the Patriots wearing these in a big game against the Jets. As per usual, there was not too much noise made in the NFL this week in the world of uniforms, so I will keep this relatively short. 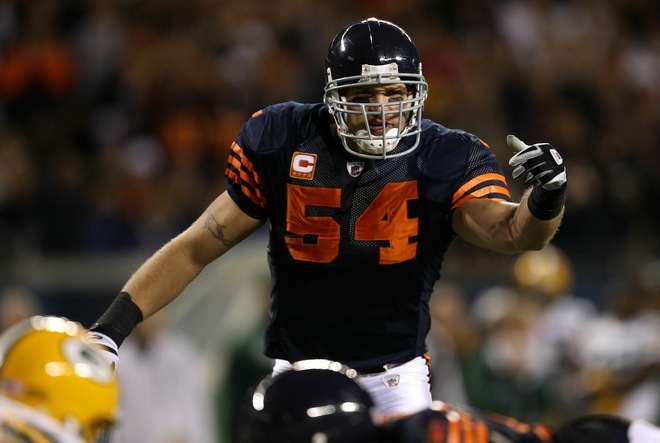 The Bears went with a look they have gone to in the recent past, but one I was hoping they had abandoned last season. On two occasions, da Bears went with a throwback last season. I liked the way the orange numbering blended into the dark blue jersey. I also enjoyed the gray facemask which usually indicates a throwback uniform. The blank helmet was the most distinguishing feature of the uniform that made it a throwback. The look worked considering the history of the Bears. Now, Sunday’s uniform choice did not have those same nice features. The most 0ffensive aspect of this uniform is obviously the orange. It’s somewhat blinding and does not make you want to watch the game anymore. When it was matched against the yellow in the Packers jersey, it made what was a pretty good game not enjoyable. I also think it takes away from a great rivalry game. If the Bears had gone with their usual home uniforms, the game would have a better feel to it. It was tough to take the game all that serious with the Bears in these stupid uniforms. 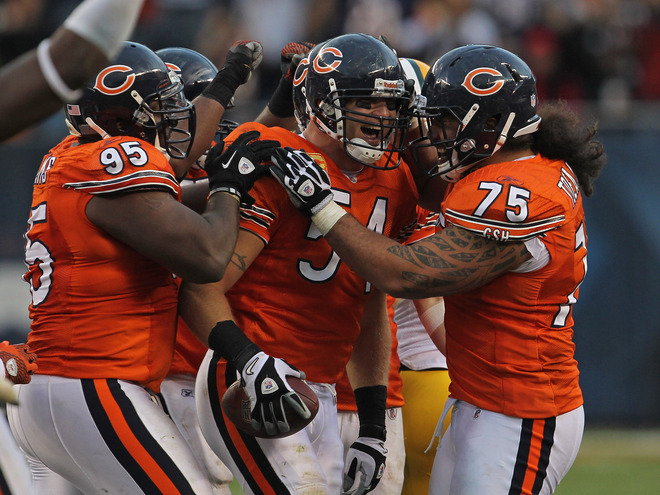 Now, apparently, these uniforms are a sort of throwback as the Bears used to wear orange home uniforms in the 30s. Those uniforms had navy numbers though, which makes me think these monstrosities (of the Midway) are simply alternates. 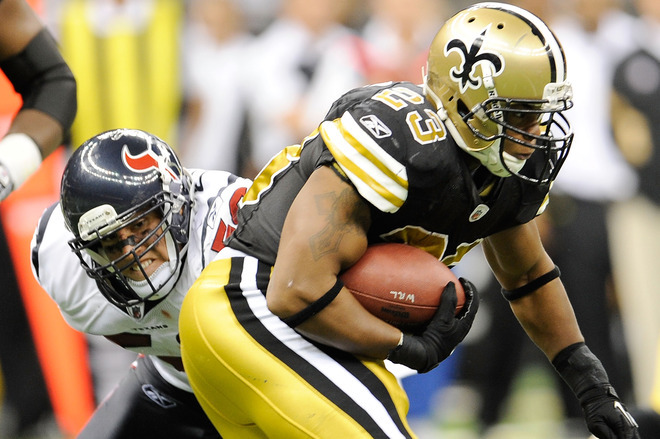 The Saints went with a throwback Sunday in their victory over the Texans. It’s a pretty good look, especially the stripes on the side of the sleeves. The Fluer de Lis is slightly bigger than the current helmet is and the pants are a different shade of gold but it’s nice. While it may remind fans of a time when the Saints were constant losers, it’s nice to see this look make a comeback. 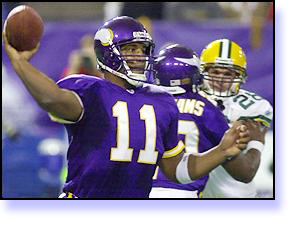 The Vikings also went with throwbacks. That have similar characteristics withthe Saints. The stripes on the sleeves are very nice as well as the stripe on the white pants. The color of the helmet is also a bit of a darker purple which works well, and the Vikings logo is slightly different than the current one. The Vikings also had a different look during the 90s. Bad job by the Chargers going with white uniforms at home. I mean, they have the best uniforms in all of sports, use them, please. Lastly, a tip of the cap to the Rams, who must have read this blog last week because they went back to their gold pants for Sunday’s loss to the Ravens. That’s all for this week, if there’s anything I missed or you want to add your comments, please feel free.